Who Are The Three Pitchers Heading To Oakland? Interestingly, Cotton was once an untouchable prospect, but the Dodgers could not resist on adding veteran southpaw Rich Hill and outfielder Josh Reddick. Well, acquiring both of them cost them three pitchers, Jharel Cotton, who is the most valuable piece in this deal, highly rated Grant Holmes, and flamethrowing Frankie Montas. Now, Cotton is the headliner in this deal, despite being ranked 13th in the Dodgers system, as Montas is ranked 8th and Holmes 5th. Cotton is 24-years-old and is ready to contribute to a major league roster. 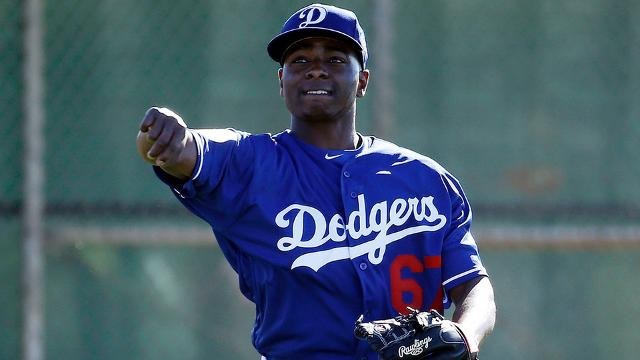 He is trying to become the first U.S. Virgin Island-born pitcher to reach the show. He can do so by dominating hitters with his arsenal. His arsenal includes a 92-96 mph fastball, a nice changeup that pairs well with his fastball, and he is working on a curveball and slider that looks like a cutter. He could be in either in the rotation or bullpen, but he has excellent command. His 2016 season has been up and down, as he posted a 4.90 ERA in 97.1 innings pitched and he earned himself a 8-5 record in 22 games (16 starts). He has 119 strikeouts this season. Next, Grant Holmes is a big right-handed pitcher that has a bulldog mentality. He is maybe three years away, as he is in Class-A. In Class-A, he has a 8-4 record paired with a 4.02 ERA in 20 appearances (18 starts). In 105.1 innings, he punched out 100 batters. His arsenal includes a 93-95 mph fastball that has the potential to go higher, a changeup that is making great progress, a tremendous slider-curveball type pitch that has depth like a curve, but the mph of a slider. Finally, the last prospect involved is Frankie Montas, who was traded in the off-season to the Dodgers from the Todd Frazier deal. He has had a slow 2016 after dealing with a rib problem, but so far he has pitched well in 4 starts (7 games overall). Combined between two levels, he owns a 2.25 ERA and punched out 22 batters in 16 innings. He is a strikeout machine and his fastball that can touch 102 mph and 80 mph slider confuses the hitters that allows him to rack the K’s up. His changeup is nothing special and he should be a closer at the professional level.